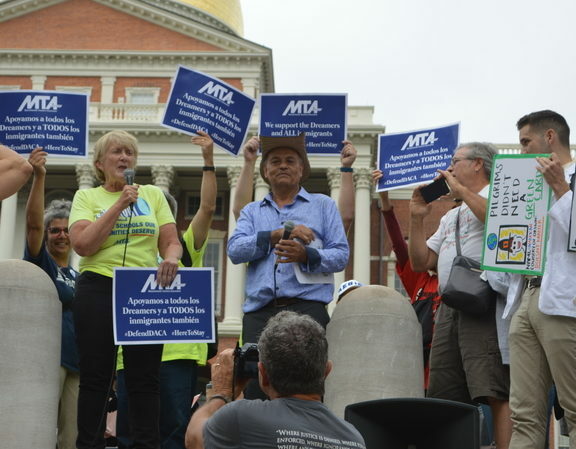 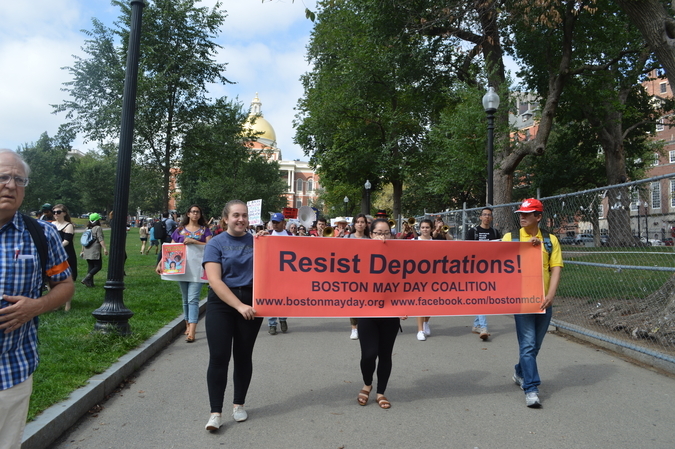 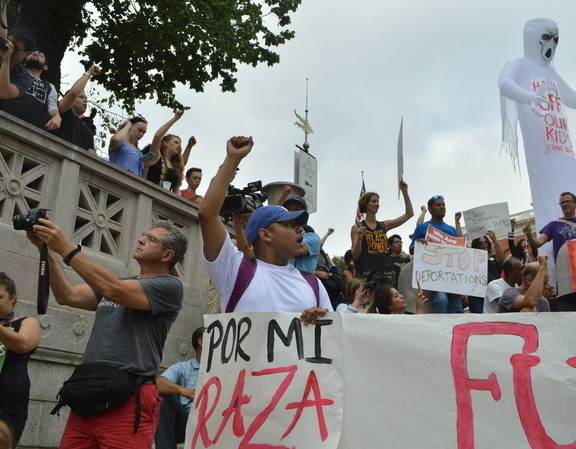 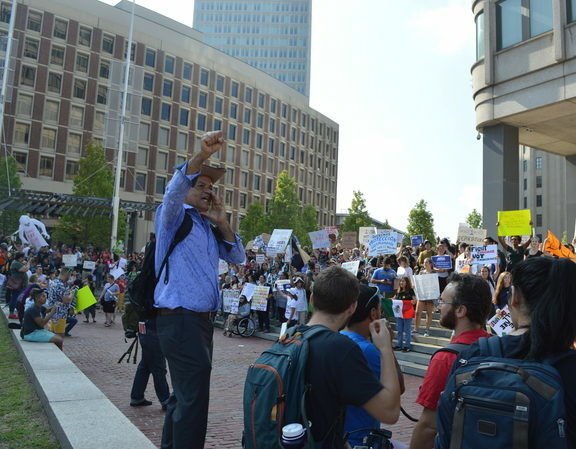 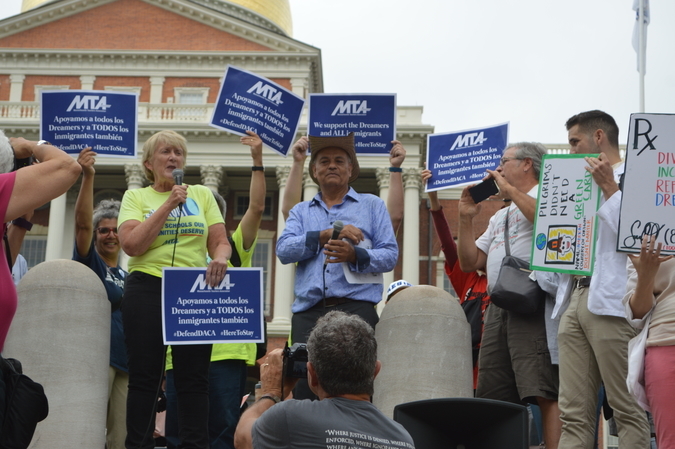 The chants of “Sí se puede” and “Un pueblo unido, jamás será vencido” were yelled in Spanish and echoed in English outside the Massachusetts State House yesterday as several hundred people gathered to protest the repeal of Deffered Action for Childhood Arrivals (DACA). 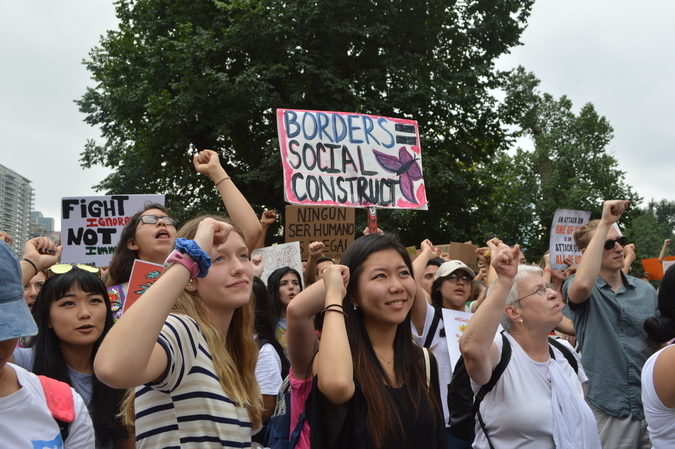 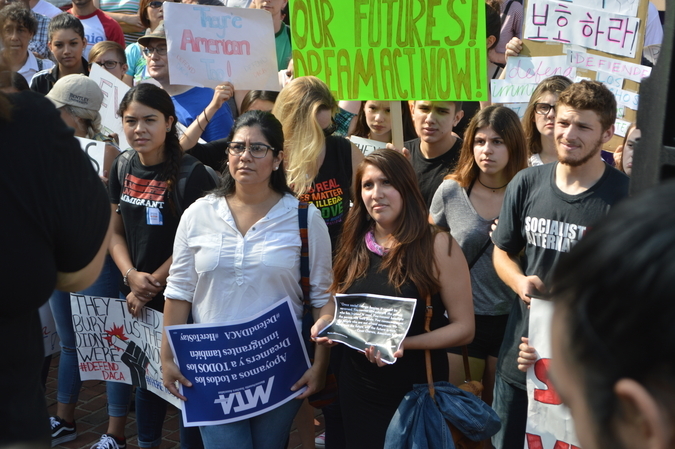 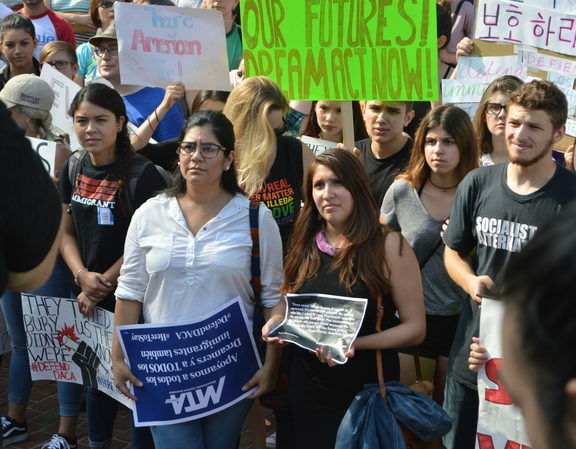 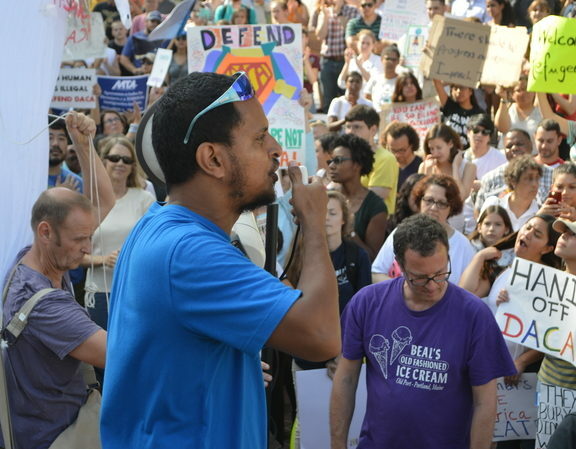 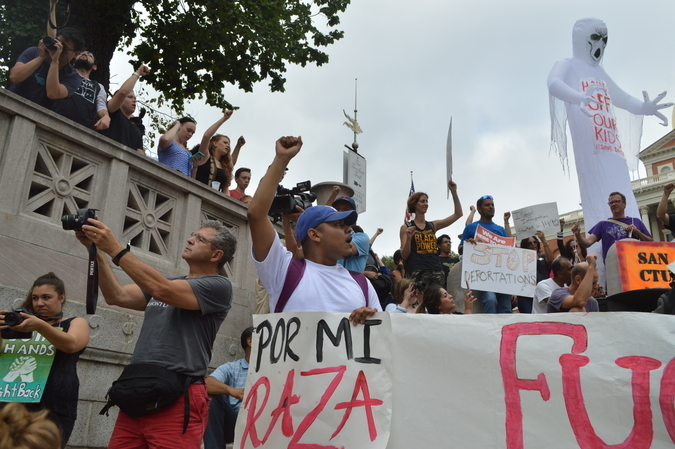 One focus of the rally was undocumented immigrants and their relation to other issues in society such as education, prisons, and workers rights. 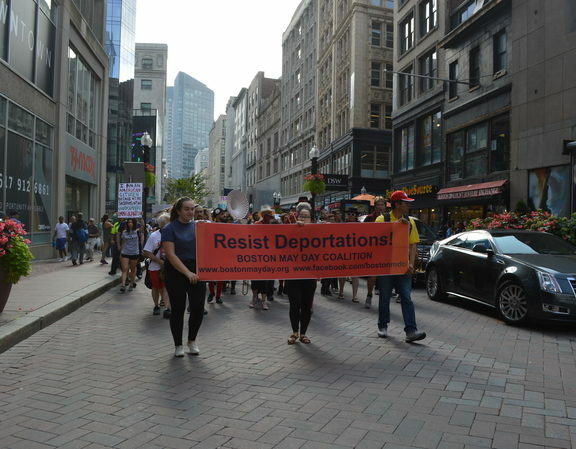 Many spoke about protecting all undocumented immigrants, workers rights including $15 an hour minimum wages, and getting rid of Christopher Columbus day, among other things. 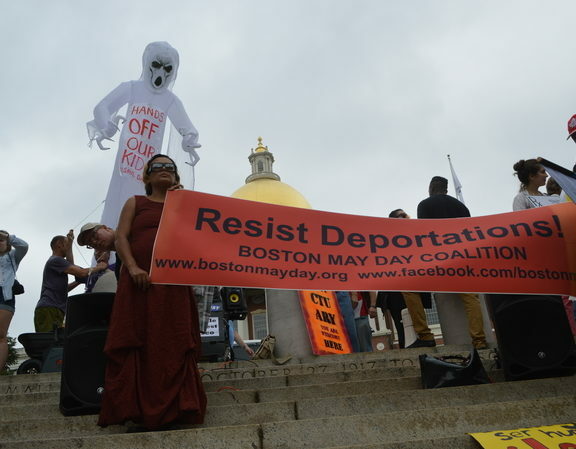 Organized by the Boston May Day Coalition and cosponsored by a variety of different organizations, including the Boston Socialist Party and Cosecha, an immigrants’ rights movement, the event began with a rally with a series of speakers and ended with a march to the JFK Federal Building where more people spoke. 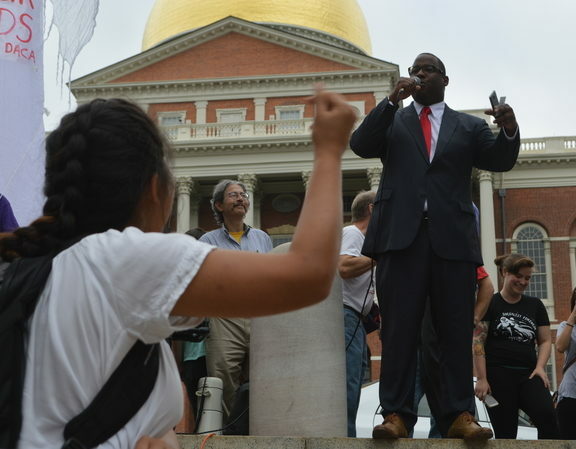 Along with representatives from some of these groups, Boston City Councilor and 2018 Mayoral candidate Tito Jackson spoke, urging the crowd to vote for him and responding personally to Donald Trump. 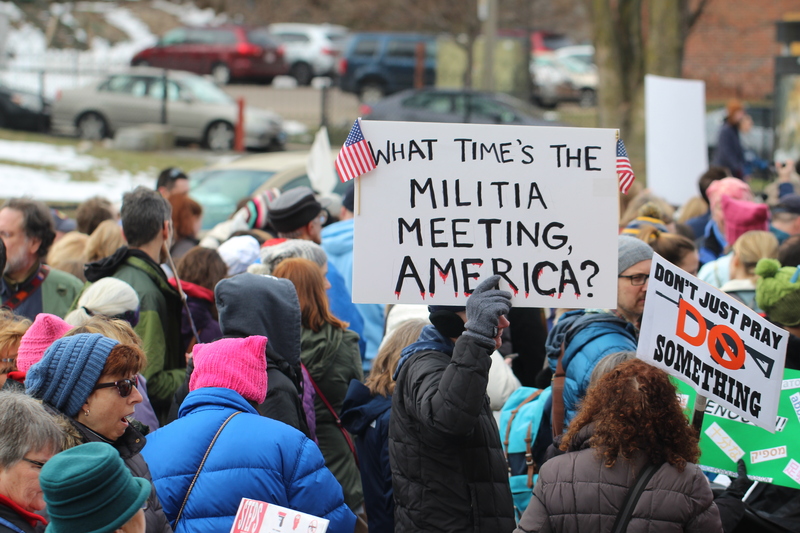 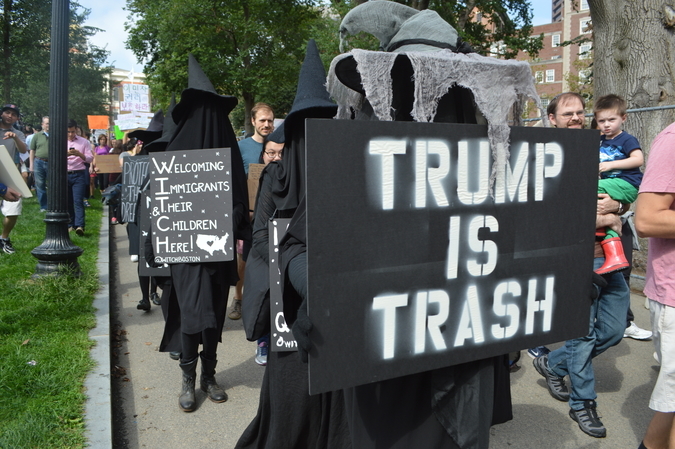 The high energy rally attracted few counter protesters and was peaceful. 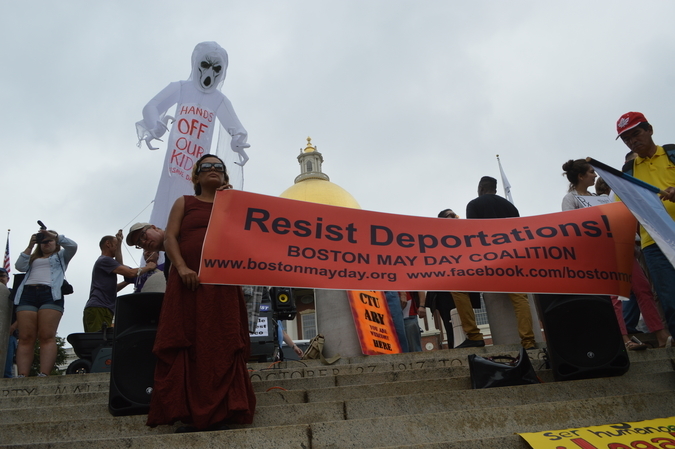 Jamie McLaughlin of the Boston May Day Coalition holds a “Resist Deportations” banner before the rally. 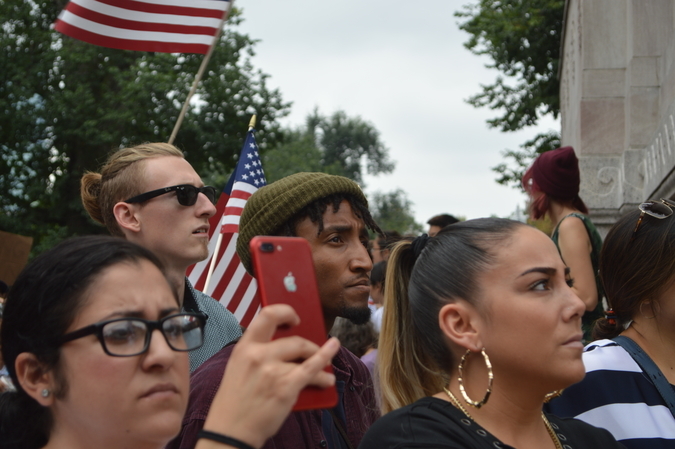 The crowd reacts to speakers and chants. 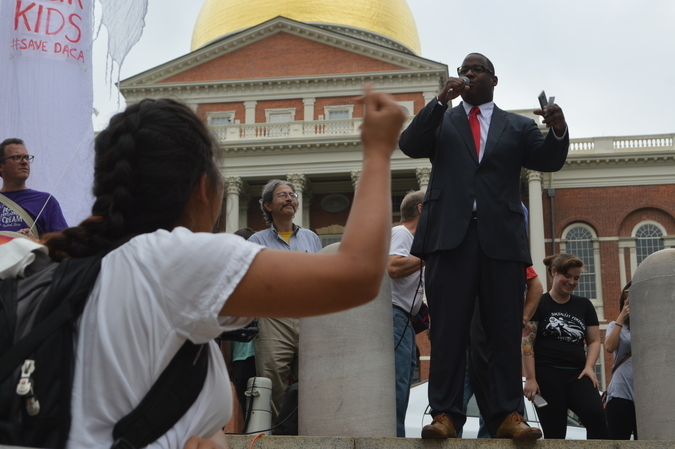 “You will not turn African Americans and Black people against our Latino brothers and sisters,” said Councilor Tito Jackson. 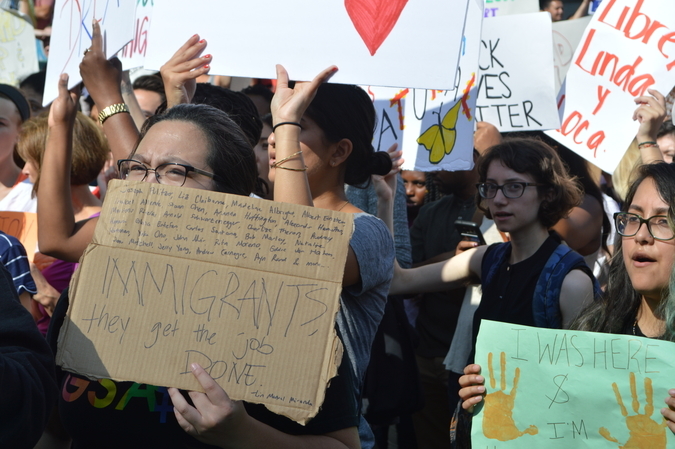 “DACA is here to stay.” He also called on the city to vote for him to make change in the mayor’s office. 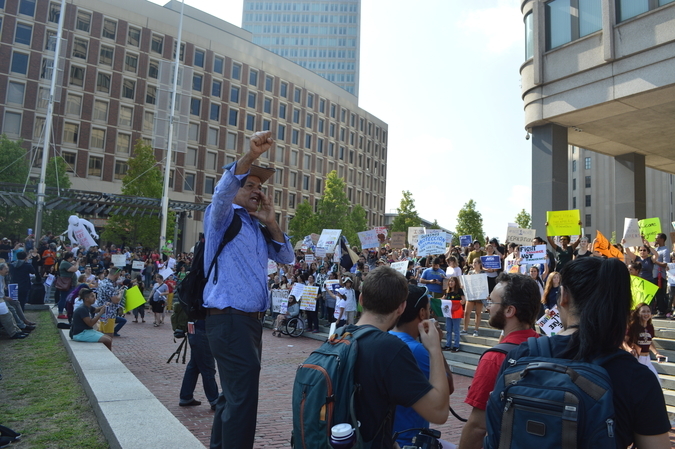 A woman who was introduced as “Barbara from Mass Teachers” discusses undocumented schoolchildren. 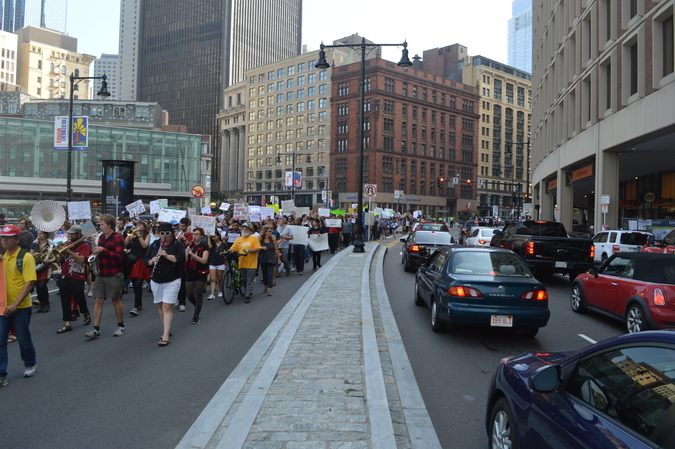 The protesters begin their march to the JFK Federal Building. 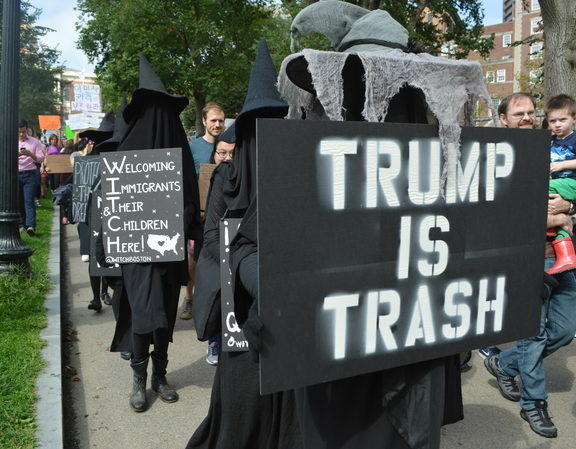 A group of people dressed entirely in black carry signs down Boston Common as part of the march. 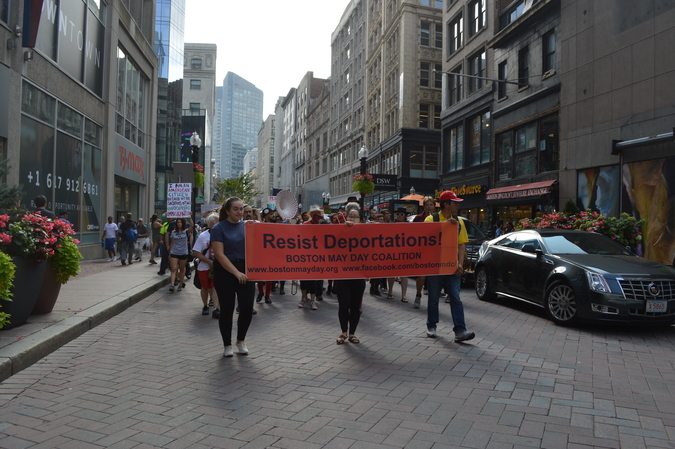 The march took the group through Downtown Crossing down Washington Street. 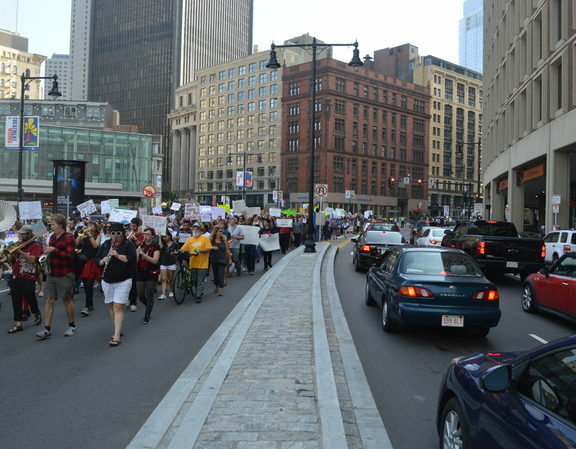 The march was led by a band but preceded by police who cleared the streets for the protesters. 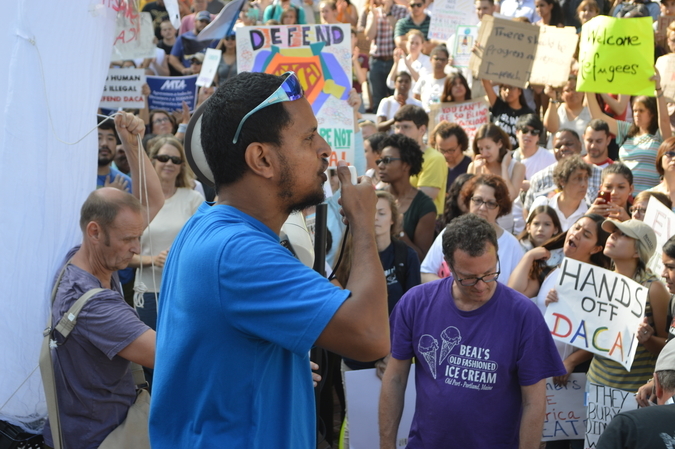 A man leads the crowd in chants in front of the JKF Federal building. 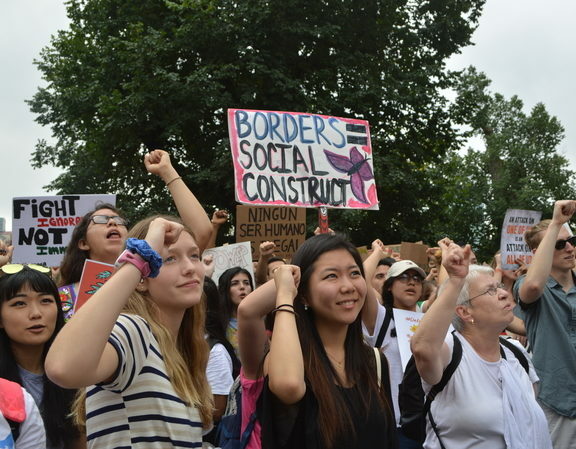 Two women react to speeches outside of the JFK Federal Building. 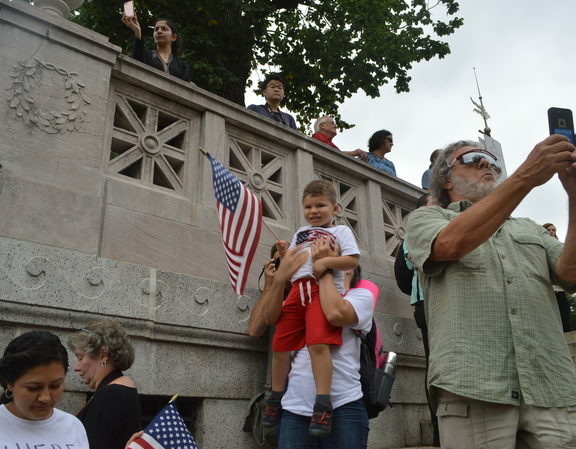 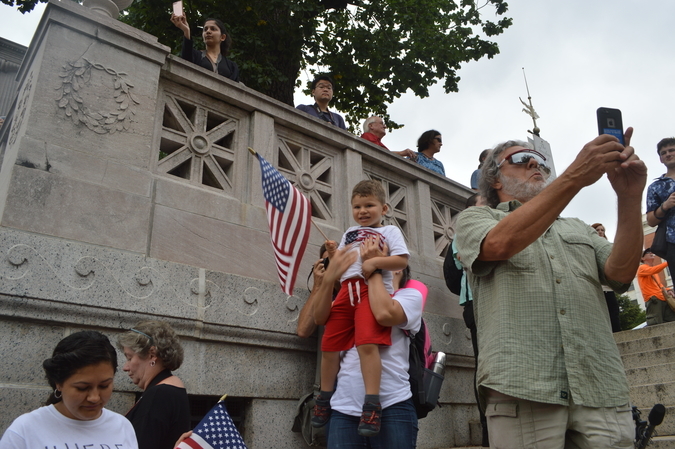 A woman lifts an american flag-clad child at the rally on the state house steps. 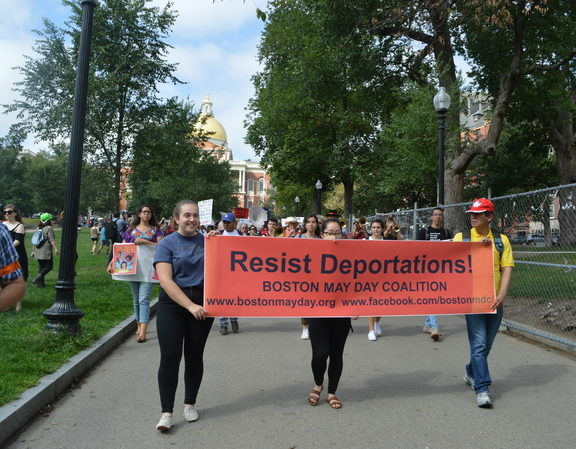 Andres Briceño of the Boston May Day Coalition speaks on student loans and how expensive college is – and the burden placed on undocumented students who have difficulty getting financial aid. 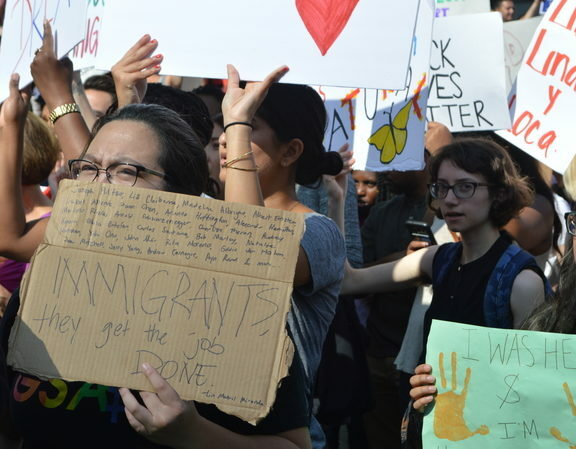 Carolyn Komatsoulis is the head photo editor of the Quad, an aspiring political and investigative reporter, and most importantly, an aspiring dog owner. 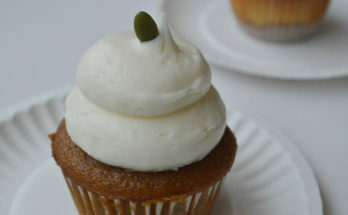 She loves telling stories, meeting new people, and informing the world what the best places to eat are. 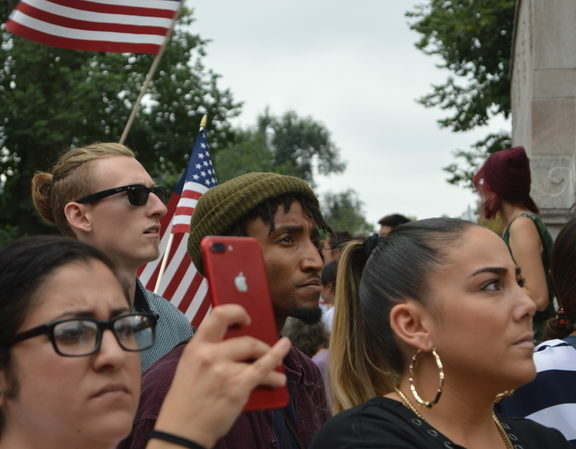 Copyright © 2019 The Quad.